This is the first of what we think will be a series of exclusive articles from Blue Harbinger's The Value and Income Forum. As the shares have sold off over the last 18 months, the dividend yield of Kraft Heinz (KHC) has climbed to 5.4%. 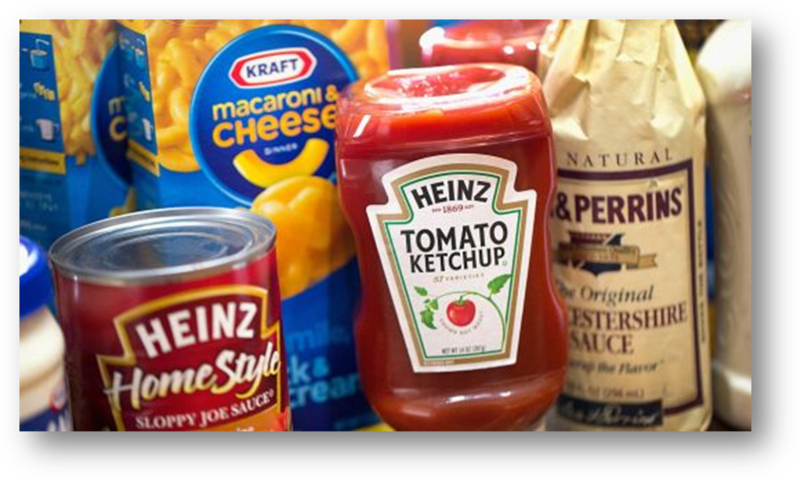 And after reviewing why the market hates Kraft Heinz, this article provides 7 reasons why contrarians may want to consider investing, including why the shares may have more than 25% upside. We conclude with our views about investing in Kraft Heinz. If you don’t know, Kraft Heinz manufactures and markets food and beverage products. For example, its products include condiments and sauces (e.g. Heinz Tomato Ketchup), cheese and dairy (e.g. Kraft Macaroni and Cheese), ambient meals, frozen and chilled meals, and for infant and nutrition. It’s headquartered in Chicago, but operates globally (its geographical segments are United States, Canada, EMEA, and Rest of the World). The company was founded on July 2, 2015 when the H.J. Heinz Company acquired Kraft Foods Group in a transaction valued at $54.9 billion. 2. Brand value has been eroding. Specifically, the company has been focusing so hard on operations (particularly on the integration of operations) that they’ve basically neglected brand strength, and thereby reduced the value of intangible brand assets. Management continue to suggest the company will put more emphasis on brand value (for example, last quarter’s earnings presentation lists “Continue to expand and deploy capabilities for brand and category advances” as part of the investment outlook and “growth agenda), but we’ll believe it when we see it. The upside of the intense focus on reducing costs is very strong operating margins (more on this later), but it has come at the cost of reduced brand value (i.e. the company is not spending enough to strengthen its brands, in our view). Also worth mentioning, consumer preferences change over time, and demand for frozen, chilled and boxed meals changes over time and depending on the market cycle (more on market cycle later). Acquisitions are expensive, can result in a lot of debt, and are usually less desirable than organic growth. Plus if they’re not a good fit, they can take a company away from its core competencies. For example, the failed Unilever deal in the above table would have taken Kraft Heinz into the “household and personal care products” space. And given KHC’s recent track record, many investors fear there may be more expensive acquisitions ahead. 4. Kraft Heinz does have a significant amount of debt. For example, here is a look at the company’s debt coverage ratios, which have generally been on the rise in recent years. The company’s debt remains investment grade with a stable outlook, but its near the lower end of investment grade, as shown in the following graphic. And if interest rates continue to rise in the years ahead, it’ll make it more expensive for Kraft Heinz to refinance its debt when it comes due, per the following maturity schedule. And worth mentioning, not only will rising interest rates increase the cost of refinancing debt, but the company is also be challenged by inflationary pressures related to higher input costs, such as resins as well as freight and logistics costs. What’s Good About Kraft Heinz? 1. Strong Cash Flow: For starters, Kraft Heinz continues to generate very strong cash flow to support the big dividend payments. The following chart shows free cash flow per share significantly exceeds the dividend payments, and is expected by analysts to continue to do so for years to come. And for more perspective, here is a look at the company’s historical uses of cash. 2. Improving Margins: Another very impressive quality of the Kraft Heinz company is its very strong, industry leading margins. We mentioned previously that the company had been neglecting spending to increase brand value, but the other side of that is very strong profitability margins, such as gross, operating, and net margins, as shown in the following table. This is a big part of the reason why Kraft Heinz has such strong free cash flow to support its big dividend. 3. Attractive Valuation: KHC is currently very attractive from a valuation standpoint relative to peers. For example, the following table shows its strong Enterprise value relative to EBIT and EBITDA and relative to peers. 4. Transitory Issues Not Expected to Repeat: You may be saying so what if KHC has a low valuation if its business outlook is not good. However, its business outlook is better than the market seems to expect. For example, recent profitability has been held back by several factors not expected to repeat such as recent supply chain inflation, unfavorable bonus accruals and commercial investments. 5. Kraft has room to grow: Not only will the absence of transitory issues favorably impact future profitability, but so too will the company’s ability to grow. For example, as mentioned in the graphics above, the company recently experienced some quarterly sales momentum and they believe it can continue. Further still, there are opportunities for Kraft to distribute its goods across Heinz’s international sales footprint thereby growing top-line numbers. Kraft is also underpenetrated in club and dollar store channels thereby more room for growth relative to peers and thanks to Heinz’s established channels. 6. Analyst Love Kraft Heinz: Even though the market hates the stock (i.e. the share price is way down), Wall Street analyst love it. For example, over the 23 analysts covering Kraft Heinz, the majority have buy recommendations, and their price target ($58.10) suggests the shares have more than 25% upside versus the current market price. However, it may be worth taking these analyst price targets with a grain of salt, considering they been recommending “buy” for many months while the share price has continued to decline. 7. Market Cycle: Of course no one has a crystal ball that predicts with 100% certainty what will happen next in the stock market, however an argument can be made that now is an attractive point in the market cycle to consider investing in contrarian/value consumer staples stocks, such as Kraft Heinz. For example, as the nine year bull market run has shown signs of slowing over the last quarter, so too has the outperformance of growth stocks over value stocks started to slow. In particular, most value stocks (including the consumer staples sector) did not sell off as much as the rest of the market as they are perceived safer, and generally perform better in an economic slowdown. Kraft Heinz, however, has continued to sell off hard, for a variety of inappropriate short-sighted reasons as mentioned above (e.g. one-time transitory challenges not expected to repeat) and thereby creating an increasingly attractive entry point for value-focused income investors, in our view, especially considering the company is showings signs of momentum in organic top-line growth. Kraft Heinz has basically been spending the last few years getting its ducks in a row relative to the competition and positioning itself for long-term leadership and value. But because the market is notoriously short-term focused it underappreciates what the company has been doing. Specifically, Kraft Heinz is hated because of its negative organic sales growth, its eroding brand value, its expensive acquisition propensity, and its increased debt ratios (not to mention the share price is down dramatically over the last 18 months). However, there are reasons to believe now may be a good time for income-focused contrarian investors to consider the shares, including its big dividend, strong cash flows, industry leading margins, attractive valuation, its falling away one-off detractors, its improving growth outlook, the fact that analysts love it, and because of where we are in the market cycle. In our view, if you are looking to add an attractive dividend yield to your portfolio, from a diversified company that is not a REIT, BDC, MLP or CEF (these are the categories in which income investors are often over concentrated), you might want to hold your nose and consider picking up some shares of Kraft Heinz. The dividend is well-covered, and the shares could have more than 25% upside from here. Leveraged loans are a bet on higher interest rates which seemed all but a forgone conclusion early last year.